A new study challenges the tenet that herpes viruses, like most enveloped viruses, are relatively unstable outside their host. Under a variety of conditions equine herpesvirus remained stable and infectious over a three week period. This suggests that untreated water could be a source of infection by some herpesviruses. The results are reported in the scientific journal “Scientific Reports”. Enveloped viruses such as herpes viruses can cause disease when spread from host to host by aerosol transmission. They are generally thought to be unstable in the environment, requiring rapid and direct transfer among hosts in order to ‘survive’ and remain infectious. A research team lead by scientists from the Leibniz Institute for Zoo and Wildlife Research in collaboration with the Institut für Virologie of the Freie Universität Berlin tested this assumption by spiking water with equine herpes viruses under different conditions over a three week period and examining whether viral DNA could be retrieved and to what extent the virus remained infectious after having been in the water. The results demonstrate that the virus does remain stable and infectious for up to three weeks, with pH and temperature being the two most important factors to determine how long the virus ‘survived’. Surprisingly, the addition of soil to the water appeared to “pull” the virus out of the water and stabilize it in the soil, suggesting that in natural water bodies viruses may persist for an extended time without infecting additional hosts. Therefore, in the case of equine herpes viruses, horses or other mammals susceptible to these viruses could be infected by herpes viruses from water bodies long after the animals that shed the virus had left the area. 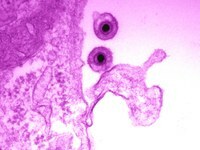 These results suggest that viruses such as equine herpes viruses may become a part of the environmental “virome” and remain infectious. Equine herpes viruses have spread among mammals such as polar bears and rhinos without direct contact with horses or their relatives in both the wild and in captivity, often resulting in fatal consequences. Shared water sources may be a source and potential vector for infection. This work is part of the ongoing project AquaVir (“Water as an aquatic viral vector for emerging infectious diseases”) funded by the Leibniz Society Intramural Competitive Fund and the Leibniz Research Network Infections’21. Dayaram A, Franz M, Schattschneider A, Damiani AM, Bischofberger S, Osterrieder N, Greenwood AD (2017): Long term stability and infectivity of herpesviruses in water. Scientific Reports.